They perfectly compliment one another in such an incredible way. He crunches numbers…She is a creative. He is quiet and reserved…She is outgoing and free-spirited. And as many differences they have, they share the most important thing in common. Their love and passion for the things of God is the glue that keeps them together and knits a future for them. They have been together for 5 years. They started off as close friends and their relationship has evolved over time. What better way to go into a marriage then to already be the best friends? Hannah & Jeff were absolutely wonderful to meet. Luke & I really enjoyed getting to know them and discovering First Landing in a new way! They live close to the state park and have had many adventures there. So it was fitting to have their engagement session there. The weather was a bit cooler than it was the previous week however, they were great sports about it! 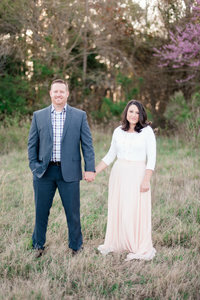 Their wedding will be at the GORGEOUS Norfolk Botanical Gardens next year and Luke & I can hardly wait! I know Hannah is going to be absolutely stunning as a bride and I am so looking forward to them walking down the aisle as husband and wife! Such a joyous couple and we know it is going to be a joyous ceremony! Definitely a wedding we are excited about!